The effects of the physics beyond the Standard Model appear very faintly in most experiments at energies below a few hundred GeV. Many experiments over the years using the K meson or B meson systems indicate that the discrete symmetries are broken at the level of 10-12 or even lower. Therefore, we need to produce at least 1012 η mesons in order to study such tiny effects. Fortunately, the hadronic production cross section for η mesons is quite large in the 1.8-2.2 GeV energy range (several tens of mbarn). At such beam energies, the low energy nuclear processes produced from protons impinging on a low A target generate mostly slow hadrons such that they would be invisible to apparatuses using the Cerenkov effect to detect the charged particles. Furthermore, the η mesons are produced resonantly inside the nuclear matter of the target and their kinematics is mostly unaffected from variations of the energy of the proton beam up to about 200 MeV. Thus, the availability of a Continuous Wave (CW) proton beam in the 1.8-2.2 GeV energy range would be a good starting point for a successful REDTOP physics program. Several simulations conducted with the GenieHad-Urqmd and GenieHad-Inclxx framework indicate that 1.8 GeV proton beam has a probability of about 0.5% to interact inelastically with the Target Systems of REDTOP. The probability that one such event will produce an η meson is about 0.4%. Therefore, a beam delivering 1011 proton/sec onto REDTOP targets will produce about 2×105 η/sec (or 2×1012 η/year). The total beam power necessary for that is less that 30 W. Each of the ten foils comprising REDTOP target systems will absorb, on average, about 15 mW of power, which can be easily dissipated without a dedicated (and expensive) cooling system. An acceleration and beam delivery system that can be used for REDTOP is currently being investigated. At present, no CW beam exists at Fermilab in this energy range, yet the most abundant source of protons is the Booster system which delivers protons at a fixed energy of 8 GeV. However, a new facility is being installed at Fermilab to produce beams for the Muon g-2 and Mu2e experiments. The centerpiece of this installation will be the Delivery Ring (DR), which is a refurbishing of a ring (the Debuncher) used during the production of antiprotons during the Tevatron era. For Muon g-2, this ring will be operated DC and tuned to accept muons at a total energy of approximately 3 GeV. 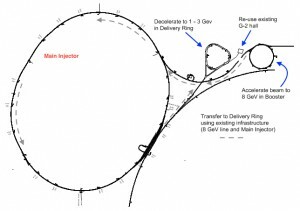 When used for Mu2e, the ring will operate with protons at a constant kinetic energy of 8 GeV and will also employ slow resonant extraction of the proton beam for delivery to the Mu2e experiment. With this in mind, it is straightforward to imagine sending 8 GeV beam to the DR in the same way as for Mu2e, then decelerating the protons to the desired energy (~2 GeV) before slowly extracting to REDTOP at the desired rate. This is the present scenario being investigated, although alternatives might also be explored. Beam from the Booster is sent through the Main Injector to the Delivery Ring at 8 GeV, before final deceleration to 2 GeV and subsequent slow spill. A single pulse from the Booster can generate 4×1012 protons; by acquiring the beam from one pulse, decelerating to approximately 2 GeV, and extracting to the REDTOP target over ~40 seconds, the production rate being sought by REDTOP can be achieved. The average beam current and stored beam energy in the DR will be much below those of the planned Mu2e operation. To design a system to meet the REDTOP requirements will take several months and the finer details will not be available within a few years. In the paragraphs below we describe the main steps associated with the development of the accelerator systems required for REDTOP. 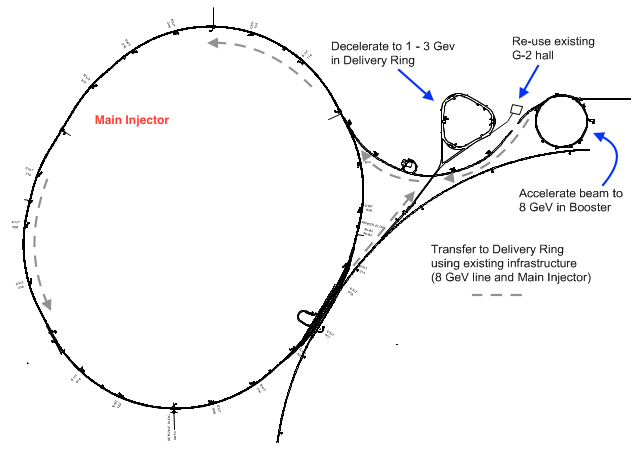 In order to generate protons at an energy adequate for REDTOP, 8 GeV protons will be delivered from the Booster synchrotron to a the 508-meter-circumference Delivery Ring (DR), currently being configured for the experiments at the Muon Campus. Unfortunately, the single, constant-frequency RF cavity being installed in that ring for the muon physics program is not adequate to remove the energy of a proton from 8 GeV to 2 GeV in a stable way. Therefore, at a minimum, a second cavity needs to be added to the DR in order to decelerate the beam efficiently and in a reasonable amount of time. It will take about 8 seconds for the two RF cavities to decelerate the beam from the initial 8 GeV to about 1.8 – 2 GeV. Additionally, since the DR system is currently to be used in DC mode for the present muon experimental program, the magnet power supply system will require some amount of reconfiguration in order to be able to vary the magnetic field appropriately during the deceleration process. In terms of beam physics, the proton beam will pass through what is called the “transition energy” of the DR (at roughly 6 GeV kinetic energy) which requires special care. (Protons pass through transition during their acceleration in the Booster as well, though at a much faster rate.) Particles moving slightly faster than the ideal speed would naively take slightly less time to circulate about the circular accelerator. However, a slightly higher momentum particle will also move along a slightly larger radius in the ring, as the magnets have less bending effect on such a particle. During acceleration the particles gain energy, but their speed is bounded by the speed of light. Thus, one can imagine a particular energy — the transition energy — where all particles revolve at the same frequency regardless of their actual momentum — a natural consequence of Special Relativity! When accelerating or decelerating through this particular energy the phase of the RF system must be changed very quickly and with care. Though the process of deceleration through transition will be studied for this ring at the deceleration rates foreseen for REDTOP to ensure efficient operation, there is another solution to this issue. Studies have found that a reconfiguration of the magnet powering system can allow for the alteration of the ring’s transition energy during the deceleration process, thus completely avoiding having to cross this condition during the operation. Such a scheme can be straightforwardly implemented by adding separate power supplies to a collection of already-existing quadrupoles in the ring. The beam circulating in the Delivery Ring after deceleration still has a bunched structure created by the radio-frequency decelerating cavities. Before sending it to the REDTOP apparatus, it needs to be de-bunched. This process takes place in the DR by turning off the RF cavities in the ring for a short period. The proton buckets will naturally relax due to their mutual interaction and their intrinsic momentum spread. A minimal structure will be retained in order to monitor the beam and to extract it in the last phase of the process. The final step in making a beam for REDTOP is by extracting it and sending to the REDTOP experiments, envisioned to be in the MC-1 experimental hall, presently being configured for the Muon g-2 experiment. The process occurs with a procedure called slow resonant extraction and it is very similar to what the Mu2e experiment has planned. Please, refer to their documentation for more insight on that procedure.